Do you ever wonder what to do with leftover pickle juice? I’ve used it in potato salad and coleslaw, as a brine for chicken thighs, as seasoning in a vegetarian casserole, and in chicken salad. But the brine leftover from the pickled red onions I made a few weeks back was unique, and I wanted to use it in a bit of a different way. I thought about it for awhile, because it contained strong flavors that wouldn’t work with just anything. 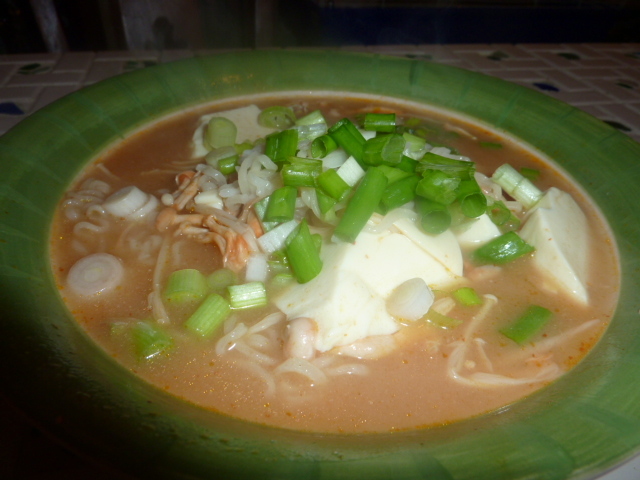 And then I remembered the silken tofu in aromatic broth I made awhile back. I remembered how the clean flavors of the tofu amplified those of the broth without competing with any other element in the dish. And I thought – perfect! By pairing the punchy flavors of coriander, pepper, mustard seed, black pepper, bay leaf, crushed red pepper flakes and garlic with the relatively blank canvas of silken tofu, I would ensure that the dish wasn’t too fatiguing on the palate. 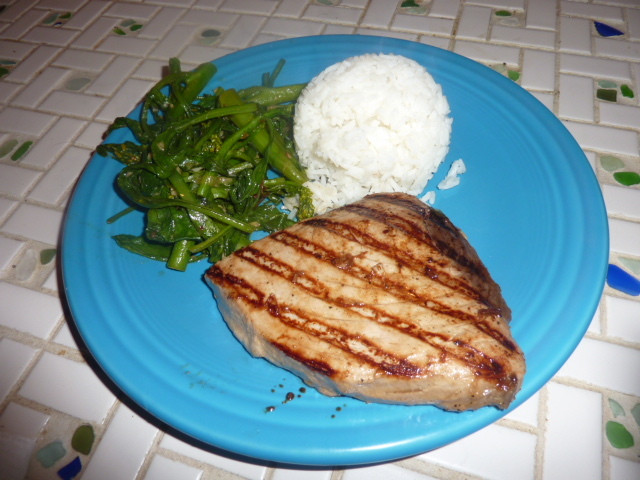 The plan paid off, and this dish was an extremely flavorful, healthy, and delicious entrée. 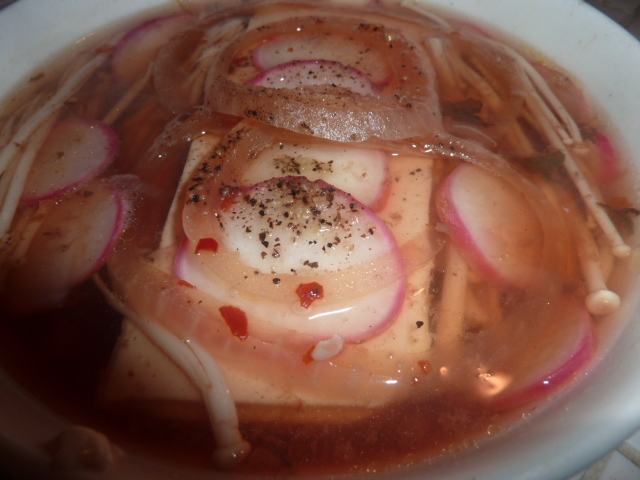 It’s also quite pretty, as the red of the radishes and pinkish hue of the broth and onions contrasts nicely with the white tofu and mushrooms. Substitute the homemade chicken stock for homemade vegetable stock if you want a vegetarian dish. Bring brine and chicken stock to a simmer over medium-high heat. Cut tofu into 2 even-sized squares. Transfer each piece to a bowl for steaming. 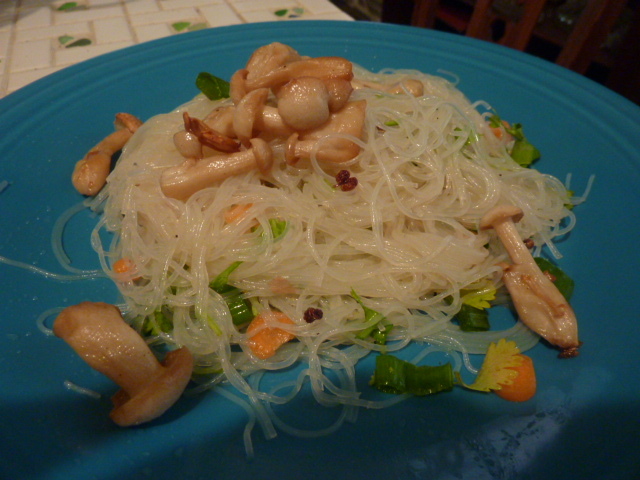 Place an even amount of mushrooms on the bottom of each dish. Pour about 1/2 cup of simmering brine/broth combination over each piece of tofu. Top each piece of tofu with some radishes and a few red onions. Add about 1/2″ – 1″ of water to a vessel large enough to fit the dishes and appropriate for steaming, such as a wok, stock pot, or sauce pan, and bring to a boil. Add the bowls to the pot directly into the water and cover with a tight-fitting lid. Steam about 13-15 minutes until heated through. Season each piece of tofu with a turn or two of freshly cracked black pepper. Americanized Chinese food is a guilty pleasure of mine. Though I’m usually pretty adventurous and love ordering off the “secret menu” or going to Cleveland’s little Asia-town for an authentic bite, sometimes I want something that you could find in the average mall food court. Because it’s tasty, gosh darn it. And General Tso’s chicken is one of my favorites in that category – it’s sweet and spicy with some yummy fried breading to sop up the sauce. I didn’t have chicken at the house but was inexplicably craving some General Tso’s, so I Googled around and came across the recipe below which substitutes tofu. We were both very happy with how the dish came out, though in the future I might reduce the brown sugar to a couple of tablespoons, add a tablespoon or two of sriracha and/or bump up the chiles, and actually remember to slice scallions for a garnish and add some sesame seeds at the end. As written, the recipe is sweet and slightly spicy with all of the classic flavors of a great General Tso’s chicken. 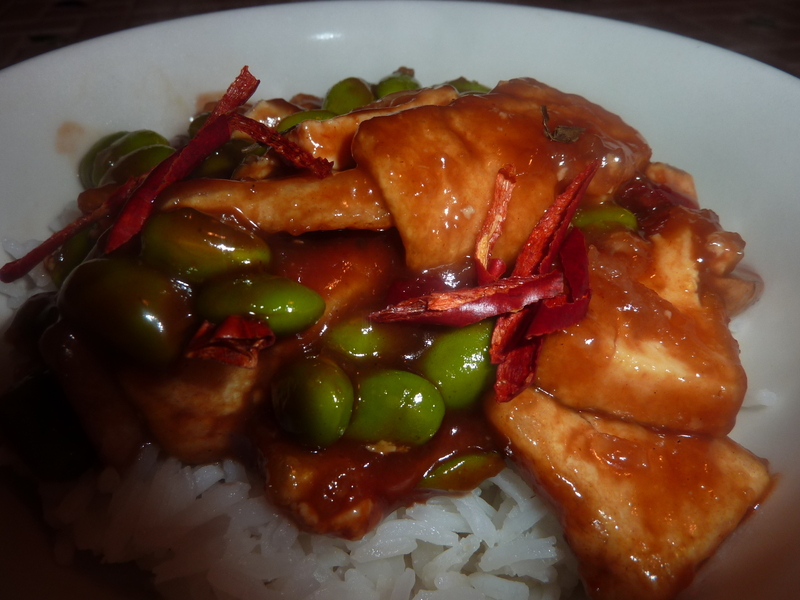 The tofu nicely sops up the sauce and the edamame provides a nice burst of color and texture. Slice tofu into 1/2″ slices and then again into thirds. Place in between two layers of paper towels and place a heavy pan or baking sheet weighed down with canned goods on top. Let sit about an hour, changing paper towels once. Whisk together brown sugar, hoisin sauce, vinegar, ketchup, soy sauce, water, and chile flakes. Place cornstarch in a shallow dish. Toss tofu slices with cornstarch to coat lightly. Add vegetable oil to a large wok and heat over medium-high heat. Add tofu, working in batches, and fry until golden brown and crispy. Set aside on paper towels to drain. Carefully wipe pan clean with a paper towel. Add sesame oil and heat over medium heat. Add edamame and mushrooms and sauté 3-5 minutes until tender. Add sauce mixture. Bring to a boil over medium heat and simmer for about 2 minutes. Add the tofu back to the pan and toss to coat. Cook a few minutes to warm through.